Tomas Brickhill talks to Eleanor and Khwaja, two of the co-founders of Passing Clouds – a ‘venue’ not just known for it’s Afro Beat and World music scene, but also for leading an exciting wave that's challenging the mainstream. We walked up Kingsland road – we had only just been walking down Kingsland road but had eventually decided that we had probably gone too far. I weakened and asked someone: Uncle Sam's; the only notable landmark was closed (although I have it on good authority that it was open again just last week) – actually once we finally found the place I realised that the problem with Uncle Sam's as a landmark was not so much that it was closed, but rather that the sign above the door was tiny and obscured, as you approach it, by the traffic lights just a foot and a half in front of it. 'What might have started me out on this treasure hunt of an adventure?' I hear you cry. I had been lured there by the promise of a 'kickin' afro-beat band and to be honest, Passing Clouds had showed up on my radar a couple of times: different friends had told me about parties there, and there had been a couple of times I had seen that there was something I thought looked interesting going on but had not been able to make it down so I was damned if I knew what it was all about. Their myspace profile seemed to have been dreamed up by a borderline fantasist and although there were some interesting pictures from the 'March of the Dead' which they had been involved in, there was no event information and their website was even more vague. I was none the wiser but had heard from so many different sources about this 'happening afro-beat venue' in Dalston... and I realised that the only solution was to seek it out for myself. I e-mailed them (essential), to introduce myself and let them know who I was and that I would be coming down, and now here I was. Wandering around the back of Uncle Sam's we discovered some people just ringing the bell to be allowed in and joined the rear of their group. Inside, a friendly face took our money and showed us wear to hang our coats: all very civilised unlike the usual venue shenanigans. Inside, the place oozed a bohemian style, and I must admit, straight away I was absolutely convinced I had finally found the coolest place in London. To be honest, part of that was an immediate and unshakeable parallel that I drew between Passing Clouds and my old favourite haunt in Harare, The Book Cafe. I couldn't put my finger on exactly what it was, but I was really quite overwhelmed by a sense of belonging and that made me quite warm and fuzzy inside. Looking around the place, the decor was simultaneously practical, makeshift and artistic – not makeshift in an Arty Farty Foundry kind of way where the scales are definitely tipped in favour of form over function (or functionality for that matter): makeshift as though the whole place might have been furnished from clearances and recycled bits and bobs, but by someone with a good eye for quality and exceedingly good taste. Various low light sources scattered around the place made it feel low key and yet far from being dingy, the place was actually fairly well lit. It was stylish without being pretentious and had an intoxicating whiff of authenticity about it. A couple of Afro-beat posters adorned the far wall next to the stage and on the ceiling a teddy-bear's picnic was all set out upside down, providing a continuous stream of people with a pleasant surprise as they inevitably happened to look up and notice it for the first time. Inside, I was pleased to quickly spot someone I knew, and in this case it was none other than Mr Run Riot himself; Jamie. We were both visiting the lovely folk at Passing Clouds for the first time and it seemed we were both wondering why we hadn't found the place before. At the bar I was overjoyed to find that the drink was very reasonably priced: the place just seemed to be getting better and better. I marvelled at the place for a while, taking a quick look around and then almost walked into the girls' loo whilst looking for the gents – which incidentally had just a wild-west style saloon swing door separating the urinal from the rest of the place. The music was not exclusively afro-beat, but of that same vibe which seemed to encourage the general friendly and sociable atmosphere about the place. Finally, the band began... a little before midnight, which I was assured was standard for any self-respecting highlife or afro-beat band. The girl who had stopped me from wandering foolishly into the ladies' loo switched on a couple of cunningly positioned desk lamps to light up the band and threw a small cloth over another lamp to stop the unwanted spill. The band were superb, championing groove over polish to achieve that slightly loose, authentic 'highlife' feel, and using vocals from the lead bassist and the percussionist to fill in for the absent horn section. Unfortunately I once again soon found myself feeling a little Cinderella-ish with my empty pockets and resigned myself to leaving the party - safe in the knowledge that at least I would be back before long. Indeed it was so, and less than a week later I found myself once again wandering past Uncle Sam's once more. This time it was I who knew where to find the entrance and pointed it out to some fellow revellers, also arriving for what was to be the celebration of Jamie's birthday. Back inside the venue, everything already seemed very familiar to me: Newcomers pleasantly surprised as they noticed the picnic on the ceiling – The same band as the previous occasion; 'Ibile'; made up, I was told, mostly of members of 'Soothsayers'. The only real difference was that this time I was aware of the presence of a number of fellow run-rioters. Such as it was, I couldn't help picturing our very own Run-Riot Kingpin as a sort of Mafia don as the cake was rolled out and we all sang happy birthday in this, the coolest club in London; a wry smile appeared across my face and I could smell adventure. This time I was in no hurry to leave: I danced, relished watching the band, tried to perfect my 'dashing-pirate-captain' look, had a couple of beers – and suddenly it was the wee hours. Doesn't time fly? A week later I find myself back on Kingsland road yet again, this time eagerly taking on the assignment to interview the folks behind Passing Clouds and find out what they were like for myself. I browsed around in the philosophy books section of Oxfam on Kingsland road looking for something interesting which I might get my sister for her 21st birthday. I was biding my time (but not in a way which was quite as ominous as that sounds) before my meeting with the people from Passing Clouds. If anything, I was a tad nervous and excited about meeting them: not because of the interview, you understand, but because I had only just discovered the place myself and I was desperately hoping that the people behind it would turn out to be as nice as I imagined there were. There is always the danger of building people up in your head and then finding yourself disappointed if they don't live up to your expectations but this was to prove an unnecessary worry in this case. Looking at the time, I decided that my sister might expect something slightly more thoughtful than a ruffled copy of 'Everything I really needed to know I learnt at kindergarten' and I wandered down to the little doorway around the back of Uncle Sam's and rang the bell. Perhaps I was still early. A few minutes later a girl pulled up on a bicycle. She turned out not to be Eleanor who I had arranged to meet, but soon directed me to the house near De Beauvoir Square where the folks from Passing Clouds reside. Eleanor, I decided, must already be a little disappointed that this writer from Run-Riot was too stupid to understand the email she had sent explaining where we should meet. I rang her, just to make sure I was now it the right place. When she opened the door I immediately recognised her from a few nights earlier as the girl who had stopped me from accidentally walking into the ladies loo the first time I had been to Passing Clouds (luckily, I dare say, she did not recognise me from a few nights earlier as the idiot who had almost walked into the ladies'). I wandered in and was introduced to some people, one of whom, Khwaja, I also recognised: he had been hanging around near the mixing desk and talking to the band when I had last been there. It was just around lunchtime, and discovering that I had not yet eaten lunch, Eleanor insisted on taking me around the corner to 'Pete's Community Cafe' in the crypt of the church on De Beauvoir Square for a bite to eat. The place is a curious merging of sandwich bar, community centre and Catholic Worker's movement activism – and if you are in the neighbourhood I thoroughly recommend it. As we sat outside having a cup of tea, I told her a little about myself in-between mouthfuls of my beans and cheese jacket potato, before Khwaja came to find us and we all walked back to their house to sit in the garden and have a proper chat. 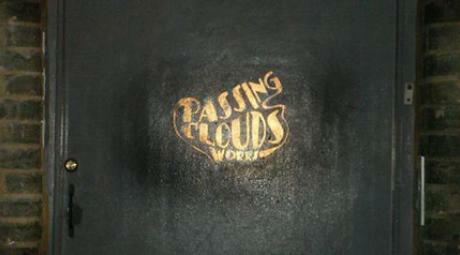 Passing Clouds, I discovered, had been an idea for a long time before it found a home and became a reality a couple of years ago. Looking around London, Khwaja and Eleanor had decided that they couldn't actually find a place that epitomised what they wanted from a venue and so they set about trying to make it happen themselves. Eleanor and some others had found the location after some searching for disused premises in the area, and Khwaja had then used his skills from years as a builder to do a lot of the work in fixing the place up. Apart from putting on various bands, Passing Clouds also organises drumming workshops, art projects and host of other activities. The venue, I discovered, is one part of a bigger idea. All the people involved work towards a general common goal of championing a better world. The venue itself is just one facet of that but a lot of it's charm comes as a direct result of these ideas of a common cause to the greater good. It is a place where musicians play for a decent night's wage, where the people who run it, do so not to make their fortunes, but to reinvest in the place and in the community, and it is a place where people come to seeking an alternative to the commercialised entertainment that has become the norm nowadays. As a girl wandered into the garden and began practising her hula hoop technique whilst simultaneously reading a book and smoking a cigarette, I asked Eleanor and Khwaja if they were trying to start a revolution? There was an intoxicating positivity about the way they spoke about Passing Clouds and about the ideals which they feel they and it stand for. Eleanor told me that a lot of people seemed to make a kind of pilgrimage to Passing Clouds once they had heard about it because they wanted to come down and join in and find out what it was all about. I realised as her and Khwaja articulated their thoughts and beliefs that Passing Clouds really is about a new cool that isn't about the clothes you wear or the job you do or the money you make – ideas that resonated to close to my own thoughts and ideas on the world at large, so I asked them who they thought the cool kids were? 'There's one now!' Another fellow wandered into the garden towards us with open arms pausing to kiss the cherry blossoms as he did. It seemed as they went on that a lot of what they said was based on this idea of not losing sight of the bigger picture; of trying to make the world better, but there was definitely a certain style about what I had seen at Passing Clouds; from the décor to the layout; the lighting, the furniture, the bar; everything, and so as Khwaja began pruning some Hollyhead in the garden I asked Eleanor whether she thought that the intent was more important than the asthetic of the thing. She paused for a moment. I was excited to learn that the whole operation may soon be expanding as well: it seems there may soon be a second larger venue if all goes according to plan... and more: a cafe? an independent artists centre? I felt reassured that the positive ideas and plans seemed endless and I thought to myself that this was surely the start of an inevitable revolution. 'It's not just afro-beat, though', added Khwaja after a thought. 'There's some Asian fusion coming, a lot of funk – in fact generally it's basically roots music with some development that brings it into something new'. 'You could say on one level it's dance music... but played by real musicians' Eleanor said. As she continued, I gathered that there was definitely a feeling that what made Passing Clouds different to other places apart from the way it was set up and run was the vibe that was deliberately created through the choice of music and acts and activities that go on there. 'We also have a zero tolerance policy on any kind of trouble,' Khwaja added hastily. I had flippantly promised a friend of mine that I would ask them if they new the results of the Zimbabwean elections. As we continued to chat about all sorts of thing from music to politics, they showed me their experimental snail farm populated with snails they had found in the garden. I realised that it was now getting on a bit and having said my good-byes, I strolled off back towards Kingsland road, my mind racing with all sorts of possibilities. Some people talk about doing things, changing things, making things better... and some people just do it. I suspect I may be spending much more of my time down at Passing Clouds now. If you had any sense, so would you.